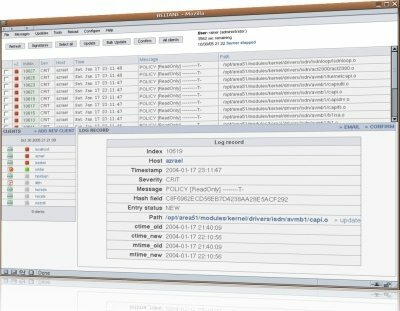 Beltane II is the advanced web-based console for the samhain centralized file/host integrity system. It enables administrators to check the status of samhain clients, browse client reports, and update their baseline databases, all from a convenient web interface. Beltane II is distributed as source code. View Details of Alerts to see what modifications have occured on the monitored machines and when. Update the Baseline when you're satisfied that nothing unexpected has happened. Sorting and Filtering of the message list, as well as a Search function. Diff viewing for modified files if full file content is stored in baseline databasei. Multiple Users with logging of login/logouts, separation of samhain clients into different groups, HTTP authentication, LDAP authentication. Full Samhain client/server installation (central storage of file signature databases, logging to SQL database). Webserver with PHP 4.3 or later, and the PHP POSIX module. C compiler to compile the C components. This is the license you need when using Samhain/Beltane II exclusively within your own organisation. Unlimited samhain servers and clients within your organisation. Unlimited beltane installations and users within your organisation. Immediate delivery: on payment completion you will be redirected to a page providing the access password.See Delivery Policy. Contract conclusion is effected with payment acceptance by Paypal. This is the license you need when managing Samhain clients installed on servers owned by, or rented to, a third party (i.e. if you provide an integrity monitoring service to a third party). This is the license you need when selling a solution based on Beltane II to third parties.